Perceptions as to the nature of the Quality Sciences and disciplines vary across the world depending on local industrial history. This can cause problems for global organisations who often want to retain the quality policies of the parent company whilst attempting to embrace the approaches familiar to local people. For example, whilst Western organisations have embraced Six Sigma, Lean and other Japanese management techniques, we have tended to adopt them in a hotchpotch fashion, bolting them on without ever understanding the context behind total quality control. In Japan, these concepts are not considered to be standalone but are all part of a seamless companywide matrix of interactive concepts, which can be summed up as company-wide quality work, of, by and for all. In essence, this means that ‘quality’ is everybody’s responsibility from the chief executive downwards. David Hutchins has over several decades worked in all of the cultural blocks and has consistently managed to integrate all of these differences into a single companywide approach. When the concepts covered are integrated into a total company-wide programme, the intention is to make that organisation the best in its business; in Japanese terms this implies ‘Dantotsu’, which means ‘number one thinking’. 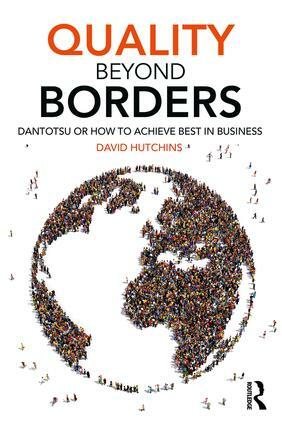 Accessible and practical in approach, Quality Beyond Borders is split into short sections, each representing a self-contained idea for the reader to digest and reflect on. It is a valuable resource for business practitioners, students and academics alike that will enable you to reach beyond your own borders to implement new ideas with significant results.